Everyone should take a listen to Beirut’s ‘Elephant Gun’, I seriously insist. I heard it for the first time and I immediately liked it. Ever since then I’ve been playing it on an infinite loop. 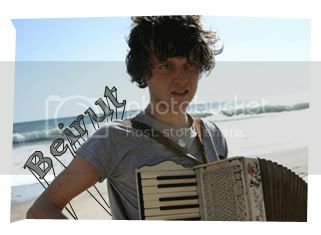 Beirut is a band but credit should really go due to Zach Condon, the super talented 21 year old multi-instrumentalist. He writes all the songs in the debut album, Gulag Orkestar and EP that contains the song 'Elephant Gun', Lon Gisland EP and it’s hard to believe that he’s still so young. If you want some hints on how his music sounds like, it’s all in the name; Beirut isn’t a band that would call itself India and make music like it’s from Japan. You’d definitely hear some eastern-European influences in his tunes. I recommend that you listen to ‘Elephant Gun’ first, and then watch its video. Because - according to me that is - the video can be a little misleading and distracting. So, listen to the music, build your own perception of it, then I believe nothing else can ruin the song for you. With music like this, who needs radio? p/s:- Other songs such as ‘Postcards from Italy’ and ‘Mount Wroclai’ is available for download (for free and illegally) at Beirut’s official website and it’s all because he loves you.